You may have noticed that I’ve never really written about my “beauty routine”. That’s because I sort of . . . don’t HAVE a beauty routine. I wash my hair once a week with baking soda, I wash my face with plain water, and a few times each week I’ll soap up (and shave) my armpits. Other than that, I don’t use lotions or potions or products. And for the most part, I don’t miss them. However. A few months ago I received an email from a representative at Juice Beauty, asking if I’d like to sample some of their line. And where I would usually shoot back a polite “no thanks!”, this time I had to pause. Because here’s the thing: I don’t know if it’s from becoming a mother, or turning thirty, or just the dry air up here in the Pacific Northwest. Maybe it’s all three. Maybe it’s because I’m such a stress case. (Ha!) But whatever the cause, the results are clear: my face could use a little lovin’. OKAY SO HERE’S THE THING! I know that “laugh lines are love tracks” and all that happy hippy jazz. I know that “natural is beautiful” and that the hypocritical patriarchy teaches us that men will blossom with age while women will wither, and I’m not supposed to care about my fine lines and impending wrinkles and Oh, Oh! how vain I must be. And that was good enough for me. I said yes. Part of maximizing pleasure, for me at least, is feeling like I’m making positive choices and doing my best to work towards a better world. Cheesy, I know, but it’s absolutely inseparable from who I am (believe me, I wish I could turn it off – that’s probably a whole other post – another time!) So even in the pursuit of vanity, it was important that I keep in accordance with my ethics. 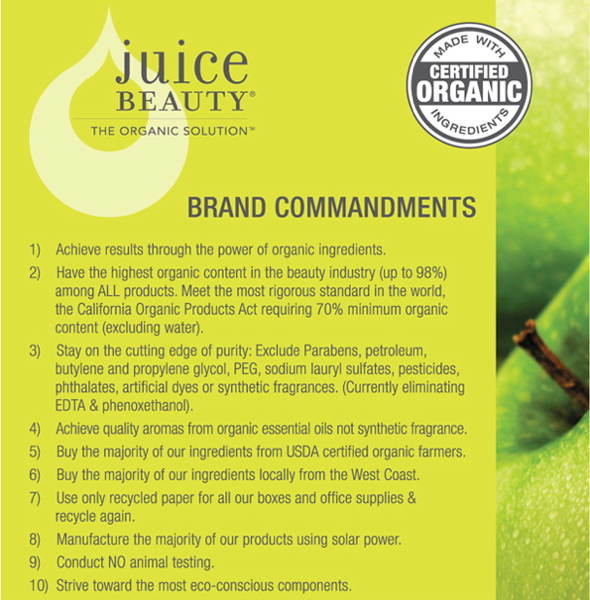 Juice Beauty was borne out of necessity, when the founder became pregnant and couldn’t find any products that both a) met her high standards of quality, and b) actually worked. So she did it herself. Yay DIY! You can read the whole story here. “I’m especially interested in “wrinkle” creams/facial care/anti-aging face products, that sort of stuff. On my blog I promote living as naturally as possible, so I tend to just skip most beauty products entirely – shampoo, conditioner, body lotion, etc. I don’t use that stuff at all, so I wouldn’t feel right reviewing it. 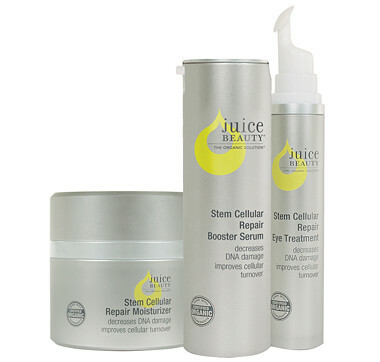 The Stem Cellular Repair kit, which includes Booster Serum, Repair Moisturizer, and Repair Eye Treatment. I used this system daily until it was gone, and all I have to say is: THIS STUFF IS AWESOME. In the middle of winter (dry air, no sun), in the middle of the holidays (lots of sugar and processed foods), my skin looked amazing. It looked the kind of amazing that it looks like after a few weeks of all-raw in the middle of summer. Over Christmas, Damian’s grandma kept telling me “You look positively radiant!” and “You’re complexion is just amazing!” and “I just can’t get over how incredible your skin looks!”. Like, over and over. And people have been saying that to me a lot lately. Dudes, if that’s not a testimonial then I don’t know what is. The only sad part is that I ran out a few weeks ago and now my skin has slipped back into its standard winter slump. I need to re-up. Oh Juice Beauty, I miss you so! 1. The scent is very strong, so much so that the first time I used the product, right before bed, it actually interfered with me getting to sleep. It’s not a bad smell necessarily (sort of lemony), it’s just very strong and I found it a bit cloying. To be fair, I hadn’t had a scented product on my face in a LONG time, so that may have had something to do with it. Regardless, I just switched to using the products in the morning instead. I got used to the smell pretty quickly; problem solved. 2. This stuff ain’t cheap. And the portions are pretty small. For something that’s SO healthful and works SO well, I understand why it costs a lot and I do think it’s worth it. Still, many of us live on tight budgets so I thought it was an important point to mention. This stuff is amazing but it’s not exactly budget-friendly. All in all, I adore Juice Beauty and consider myself a convert. I’m thrilled to have an anti-aging cream that does its job, but that doesn’t rely on nasty toxic ingredients. As far as I’m concerned that’s a dream come true! Wahoo! I’ll definitely be taking advantage of this generous offer (birthday present to myself, w00t! ), and I hope you guys enjoy it too! Also please know, I don’t get any commission for this, or anything shady like that. I just really dig this company and I’m happy to have found something natural that WORKS, and I want to share the love. I’m so glad to read this post! I’ve used the Clinique face lotion (I know … hisss…) for about 20 years and this month’s goal was to find an animal-friendly replacement. I had about a year’s worth given to me a year ago, before I went vegan, and am coming to the end of supply. So I’m excited to check their products out! Thanks again! I love this post. I have been looking for a new product line to use on my face, and this one sounds super promising. Off to check it out now! a few weeks ago, I started using organic coconut oil (which I normally use for cooking and baking) as a face moisturiser and I love it. It’s pure, simple, cheap and does the job. But I’m not sure if it’ll work for every skin type. Mine is combination with dry parts (especialy during the winter months). Also, how long did the Juice Beauty trio last you? I use coconut oil for a nighttime moisturizer and I love it, too! I have “normal” skin (not dry, not oily), but also very sensitive and eczema-prone. Coconut oil works wonders! I bought the Organic Juice Beauty Facial Moisture concentrate in April and have used it every single night since then. I just had to throw it away last week. While it was a bit on the expensive side for moisturizer, I only had to use a little of the product and it lasted a very long time! I do love these products! So you don’t use body lotion either? You have a whole post on your favorite body lotions – what changed? Are you using oil now? I’ve been searching for the perfect body oil, which I like to slather on after the shower rather than lotion these days. I really need some eye treatment like this one, but I just can’t hack the big bucks. I hope to find a cheaper alternative that works as well as this one sounds like it does! Whoa, glowing review! And all the reviews on their site are pretty glowing too! Bummer they don’t ship to Australia otherwise I would have just made a pretty nice impulse buy! I have just been thinking the same thoughts about my own face, between motherhood, aging and stress, not to mention lack of sleep. I stumble in the beauty isle, worried about toxins and being harmful to the environment not to mention the pocket book. If I could have anything it would be healthy hair and beautiful skin, who cares about mascara and lipstick. Also, I struggle with making time for myself and taking care of myself and if one thing I do is take care of my skin, that is a small uplifting habit that may help me age then there is no harm. Thanks for the review. It is pricey. I am going to look more into the product. Check back later today for a special deal! It’s coming! Check back later! A few months (3 or 4), but I was using it quite liberally. You could definitely make it last longer by exercising a little . . . *ahem* . . . restraint, haha. I used to use lotion but I’ve since stopped. After Waits was born my skin became incredibly sensitive (due to hormones) and I would get rashes from everything, even plain coconut oil. That actually ended up being a good thing since I weaned off of lotion completely, and after a horrible dry period, my skin adjusted and now I no longer *need* lotion at all. Except my face, which dries out and shows age, especially during winter. So this product was much appreciated! I’m with you S about the myriad complexities in using products from the “beauty” standpoint to the environment, to health and so on. In my experience I find the best things recommended through friends or people who’ve used a product and had postive results, the first hand reviews are the best! So thank you, can’t wait to check out Juice Beauty. I checked out their website and I so wish I could afford their blemish kit. I guess I’m going to have to keep trying with Burt’s Bees until I can afford them. Definitely seems like it is worth it though! That’s cool that your body adjusted. Bummer about the sensitivities, though. 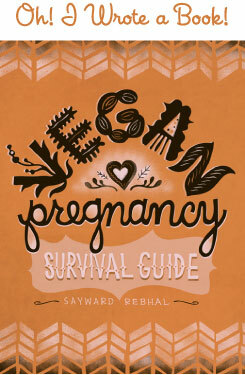 Isn’t it strange how pregnancy, which is lovely and natural, can wreak such havoc on our bodies! oredered, used code. so happy! btw, sayward, you re lovely. love the non shadyness. Woooohooooo! Just placed an order! Can’t wait to get it. Thank you for the review and getting us a promo code! I will soooo be using that! I have been wanting to switch over from Proactiv Solution to something more natural (and not tested on animals, animal testing is so sick!). I am so excited to be able to try this brand, and it’s nice to know it comes so highly recommended. Thanks a bunch! Thanks, Sayward! I put in my order today… and crossing my fingers that it will give a new life to my wintry weary .. and sadly my not even 30s wrinkly!!.. skin. This is fantastic. The best part is that they ship to Canada and the Bonzai free shipping code worked for me too :) I’ve been looking for some natural blemish fighting skin care products and can’t wait for it to arrive! Thanks! Weee! I just ordered a bunch of stuff! Can’t wait for it to get here! The timing of this for me is spot on! Thanks! Wow I’m so happy that you love juice beauty!! I have been using some of their products for 6 months and I have noticed a real difference in my skin! The best part is that it is all natural and organic :) My favorite in the stem cell kit is the repair eye treatment. I no longer look like a raccoon in the mornings because my under eyes are brighter and tighter!